Sabaton – Sweden’s and probably the world’s leading bunch of metallic war historians – has commonly been referred to as a heck of an on-stage dynamo, at least in my neck of the woods. The two festival shows that I’ve witnessed in front of them have certainly been rousing experiences. Thus I was very interested when word came out that 12 years and 5 official studio albums into their career, the band was coming out with their first official live album. The performance of the band is very tight and I must especially commend their vocal powerhousing with several band members giving support fire on the mics for vocalist Joakim Brodén, whose decidedly masculine croon is still wonderfully unique and fitting for music this anthemic. The band’s back-up voices may not be the most technical and note-prefect around, but dammit there is energy and fire in there! Their playing from one instrument to another is solid and they bring the power when backed by a mixing job this good. The certain rawness of the live act remains while still keeping everything balanced and punchy. A more peculiar tidbit, one that could actually even annoy some listeners, is that Brodén recites almost all of his ample between-songs-banter in Swedish. Most likely most of the travellers on the boat were Swedos as well, so there you go. For a fellow Scando like me, it’s not that distracting but anyone not familiar with any Scandinavian languages may be left feeling a tad on the sidelines. Then again, the dynamics of the banter make up for a lot of it. Several times, Brodén has a shouting crowd vote on the setlist, naming two Sabaton songs in a row and measuring the requesting shout-volume of the audience to decide which song to play. A very cool little detail to do at live shows if you’ve got enough songs handled, methinks. Fortunately the shouts for both The Art Of War and Attero Dominatus were so loud that they played them in succession anyway. And the overall setlist rules, of course! Especially pleasing to me as a Finn is the inclusion of White Death, the tale of one of our country's most famous war heroes, the legendary sniper Simo Häyhä. Utterly needless to say that you should hunt down this whopping limited edition, as will I. For Sabaton-fans, I would deem this package a Must-Have. 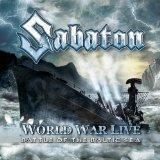 Hell, for anyone wanting to experience a kickass live metal show on their home couch, World War Live: Battle Of The Baltic Sea is a damn fine choice.